Claire Foy as Lisbeth Salander in “The Girl in the Spider’s Web”. IN 2015, when David Lagercrantz published the fourth title in the “Millennium” series that we all thought would end when Stieg Larsson died, many readers who probably picked it up out of curiosity put it down feeling that Larsson’s legacy of characters, relationships and situations duly honoured its forebears. 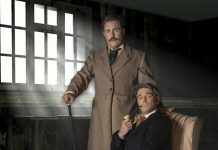 The film history of the first three involved three directors, screenplays by three different writers and three men and three women playing the core characters. 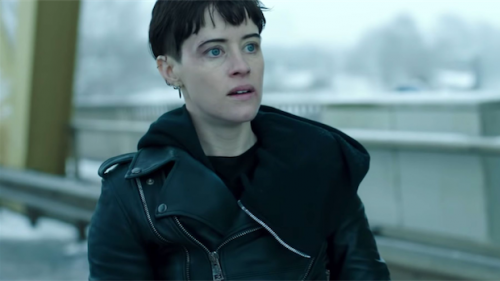 That pattern continues with the fourth story centered around the whiz computer hacker Lisbeth Salander, this time played by Claire Foy, with Sverrir Gudnason playing investigative journalist Mikael Blomkvist relegated to a supporting role. Number four is written and directed by Uruguayan filmmaker Fede Alvarez who knows how to grab filmgoers where they feel it most. It’s his fourth film. I found it relatively faithful to the novel and thus to the series’ legacy but a tad tedious, taking 115 minutes to deliver much drawn-out action with great physical vigour but less narrative variation than I expected. What is it about? Bad guys and good guys, as you might expect. The object in dispute is a computer system that will give whoever holds it access to a lot of defence data to the detriment of the free world. Its creator has a single-digit-aged son whose autism has not crippled his geeky talents. The kid holds the key to get into the system. The Yanks have sent an agent under cover to Sweden to get the kid. Lisbeth feels sympathy for the little boy’s situation. Cue to her unarmed combat prowess, her talent for driving Ferrari cars and Ducati motorbikes and her high pain threshold and let ‘er rip! Larsson’s “Millennium” three novels ascribed Lisbeth’s quirky behaviour to family problems since childhood and saw them all deceased. This one reminds readers of her twin sister, as nasty as the brother with a high pain threshold. I had a quick look at what cinema writers abroad have said about this film. I share their general consensus, that the film is banal and disappointing.